Objective To compare perinatal and maternal morbidity and birth interventions in low-risk women giving birth in two freestanding midwifery units (FMUs) and two obstetric units (OUs). Design A cohort study with a matched control group. Setting The region of North Jutland, Denmark. Participants 839 low-risk women intending FMU birth and a matched control group of 839 low-risk women intending OU birth were included at the start of care in labour. OU women were individually chosen to match selected obstetric/socio-economic characteristics of FMU women. Analysis was by intention to treat. Main outcome measures Perinatal and maternal morbidity and interventions. Results No significant differences in perinatal morbidity were observed between groups (Apgar scores <7/5, <9/5 or <7/1, admittance to neonatal unit, asphyxia or readmission). Adverse outcomes were rare and occurred in both groups. FMU women were significantly less likely to experience an abnormal fetal heart rate (RR: 0.3, 95% CI 0.2 to 0.5), fetal–pelvic complications (0.2, 0.05 to 0.6), shoulder dystocia (0.3, 0.1 to 0.9), occipital–posterior presentation (0.5, 0.3 to 0.9) and postpartum haemorrhage >500 ml (0.4, 0.3 to 0.6) compared with OU women. Significant reductions were found for the FMU group's use of caesarean section (0.6, 0.3 to 0.9), instrumental delivery (0.4, 0.3 to 0.6), and oxytocin augmentation (0.5, 0.3 to 0.6) and epidural analgesia (0.4, 0.3 to 0.6). Transfer during or <2 h after birth occurred in 14.8% of all FMU births but more frequently in primiparas than in multiparas (36.7% vs 7.2%). Conclusion Comparing FMU and OU groups, there was no increase in perinatal morbidity, but there were significantly reduced incidences of maternal morbidity, birth interventions including caesarean section, and increased likelihood of spontaneous vaginal birth. FMU care may be considered as an adequate alternative to OU care for low-risk women. Pregnant prospective mothers should be given an informed choice of place of birth, including information on transfer. The safety of birth in free-standing midwifery units (FMUs) is strongly debated, as acute complications may arise in a spite of a careful risk assessment of women. Prior studies suggest that FMU care for low-risk women is related to low perinatal and maternal morbidity, fewer interventions and a decreased use of medical pain relief compared with care from obstetric units (OUs) care, but some are limited by, for example, the inclusion of high-risk women, low number of participants, and inadequate control of bias and confounding. The present study aims to compare perinatal and maternal morbidity, birth interventions, and pain relief in low-risk women giving birth in two freestanding midwifery-led units and two obstetric units (OUs) in Denmark. No difference in perinatal morbidity was found among infants of low-risk women who intended birth in an FMU compared with infants of low-risk women who intended birth in an OU. More studies on rare adverse outcomes are needed. FMU care had important benefits such as reduced maternal morbidity, reduced use of birth interventions including caesarean sections and increased likelihood of spontaneous vaginal birth compared with OU care. However, 37% of primiparas and 7% of multiparas transferred during or <2 h after birth. Care in FMUs may be considered as an adequate alternative to OU care for low-risk women, and women should be given an informed choice of place of birth, including information on transfer. The study compares processes and outcomes from women who have been rigorously and prospectively judged to be at low obstetric risk in two well-defined and carefully established settings in the same region. Data are complete, as all eligible women planning to give birth in the FMU settings were included, and full follow-up on all participants was obtained. 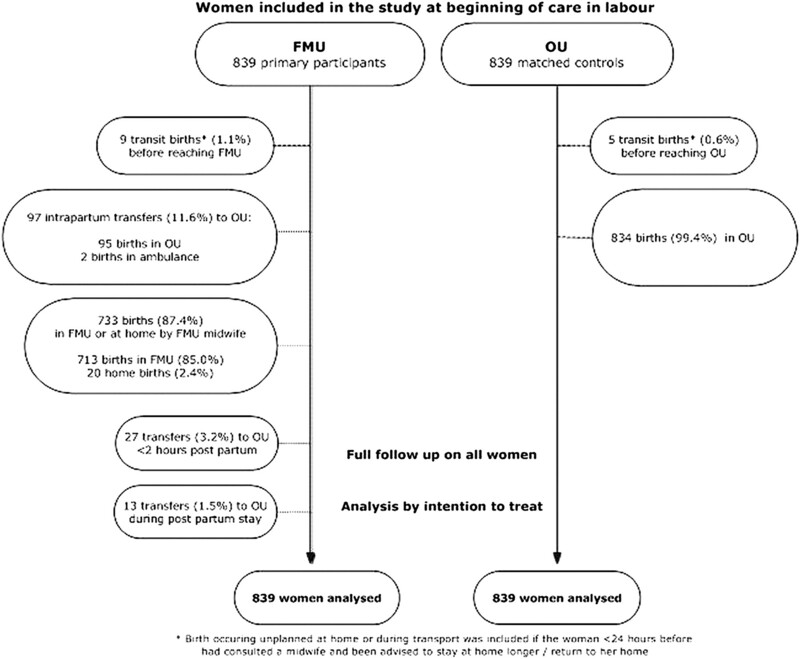 Although the study groups were matched, and adjustment for the matching factors revealed no residual confounding, the risk of confounding by unknown factors related to women's choice of care in labour persists. A Cochrane review concerning alongside midwifery units (AMU) found no significant differences in perinatal mortality or perinatal and maternal morbidity. It also documented significantly fewer medical interventions and increased maternal satisfaction.12 However, this evidence cannot be generalised to freestanding midwifery units (FMU). Concern has been expressed that acute intrapartum and postpartum complications may arise in spite of careful assessment of low-risk women and that transfer delays may affect lifesaving medical interventions such as caesarean section or advanced neonatal resuscitation. Two prospective, controlled cohort studies of FMUs16 17 both report low perinatal and maternal morbidity, fewer interventions and decreased use of medical pain relief. The results are supported by a wide range of retrospective, uncontrolled and/or population-based studies,6 10 18–30 but the evidence is conflicting, as two of these studies found significantly lower 1 min Apgar scores28 and an increased need for neonatal ventilation10 in FMUs. Because of greatly varying criteria for low-risk categorisation, care standards, midwives' training, cooperation between FMUs and OUs, etc, considerable caution must be observed when generalising findings to other settings and countries. Furthermore, the level of evidence was weak.31 The applicability/validity of many studies is limited by factors such as small sample size, inclusion of high-risk women, limited control of bias and confounding, and inadequate descriptions of inclusion and exclusion criteria, medical assistance (if any) and transfer criteria. There is a need for further research, but the rarity of adverse outcomes in a low-risk population, the limited number of FMU births and women's strong preference for choice of birthplace32 33 converge to form serious barriers for the investigation of perinatal mortality in large, adequately powered, randomised controlled trials. This increases the need for evidence from carefully planned cohort studies. On the basis of previous research, we hypothesised that FMU care, with its emphasis on the physiological birth process and psycho-social well-being during childbirth, would entail a number of positive effects for the women, such as a higher rate of spontaneous vaginal birth, intact perineum, and use of non-pharmacological pain relief. FMU women were hypothesised to experience fewer interventions (including caesarean section) and require less use of pharmacological pain relief compared with OU women. No differences in perinatal or maternal morbidity were predicted. The study was conducted in North Jutland, a relatively sparsely populated region of Denmark where the local health authorities in 2001 had decided to transform two of the region's four maternity units into FMUs, opening in 2001 and 2004. The FMUs offered midwifery-led care during pregnancy and intrapartum and postnatal periods to low-risk women. In a 3.5-year period between 2004 and 2008, data on socio-demographic factors, previous pregnancies and births, current pregnancy and birth, infants, FMU transfers, and maternal/neonatal readmissions 0–28 days postpartum were collected from patient records and the North Jutland Patient Administration System. The data collection was carried out by project staff with comprehensive professional knowledge of the field on basis of written instructions. In Denmark care for low-risk women is midwifery-led in all birth settings. Both FMUs were located in community hospitals with an intensive care unit but without an obstetric service. The annual numbers of births in the FMUs were approximately 170 (Hobro) and 130 (Frederikshavn). Women transferred to OUs by ambulance using multidisciplinary regional criteria and continued care with an FMU or OU midwife under the supervision of an obstetrician. FMU midwives had at least 2 years' experience and training in obstetric emergencies, including ventouse delivery. FMU midwives provided antenatal care and out-of-hours postpartum care for all women in the area booked for both OU and FMU birth. FMU midwives also assisted at the nearest OU, if FMU not busy, and had 40–70 births a year. Additional contextual information is available in online table A.
Aalborg University Hospital is a one of five highly specialised Danish hospitals with a specialist OU who saw approximately 3500 births a year. Vendsyssel Hospital is a provincial hospital with 10 clinical specialities, including an OU providing care for low-risk and most high-risk pregnancies and a generalised paediatric ward. The annual number of births was approximately 1400. Mothers and infants with severe illness were transferred to Aalborg University Hospital or one of the other four, highly specialised hospitals in Denmark, depending on the condition (additional contextual information is available in online table B). The study population was composed of an intervention group of 839 low-risk women from two FMU in Hobro and Frederikshavn, and a control group of 839 low-risk women, matched for key factors, who received routine care from the specialist obstetric unit at Aalborg University Hospital and the obstetric unit at Vendsyssel Hospital, Hjørring. All labouring women admitted to the FMUs by their midwives on the basis of multidisciplinary, regional admission criteria were included in the study. As informed consent of participation was not required due to Danish legislation, all eligible women were included. Women in the control group were eligible for inclusion only if they represented an individual match to the obstetric and social characteristics of a woman in the FMU group. Women in both study groups were thus rigorously judged to be at low-risk and fulfil criteria for FMU birth, and included at the start of care in labour. Excluded from the study were three women admitted to an FMU for emergency treatment without satisfying the criteria for FMU care; an event occurring very rarely. Women in the control group were selected from the region's patient administration system which carries detailed information on the region's pregnant women. For each participant included in the FMU group, a control participant from the nearest OU was identified among the admitted low-risk women. The selection of matched control participants was conducted in accordance with strict guidelines by project staff that were blinded to the identity and the birth outcomes of women in the FMU group. The matching result was blinded until the selected control participants had given birth. Matching was done prospectively on criteria with an established influence on birth outcomes42–45: low-risk status, parity, smoking, body mass index (BMI), age, ethnicity, education, occupation and cohabitation status. A 100% match was carried out on: low-risk status, parity and smoking status. BMI and age were matched with a range of ±5; meaning that BMI/age scores of 22 were matchable with scores between 17 and 27. Socio-demographic characteristics such as ethnicity, education level, occupation and cohabitation status were matched within groups as shown in table 1. Women were judged to be at low risk if they were healthy, presented in spontaneous labour between 37+0 and 41+6 days of gestation and had an uncomplicated pregnancy and no medical/obstetric history or conditions increasing obstetric risk as outlined in the UK NICE intrapartum care guidelines.46 However, we considered healthy multiparous women as low-risk regardless of their age and BMI if their previous pregnancies and deliveries had been uncomplicated. The primary outcomes were Apgar score <7/5 min and caesarean section. Secondary outcomes were as follows: (infant) Apgar score <9/5 min, <7/1 min; neonatal asphyxia; admittance to neonatal intensive care unit (NICU); admittance to NICU >48 h; neonatal readmission 0–28 days postpartum; (maternal) spontaneous vaginal birth; intact perineum; epidural analgesia; use of water tub for pain relief; abnormal fetal heart rate leading to action; dystocia; shoulder dystocia; instrumental vaginal delivery; postpartum haemorrhage >500 ml; first-/second-degree tear; third-/fourth-degree tear; maternal readmission 0–28 days postpartum. These outcomes were, along with a range of additional outcomes, defined prior to the initiation of the study, and reported as well as all cases of perinatal mortality and severe perinatal and maternal morbidity. Unfortunately, data on umbilical blood gas could not be obtained. The intended birthplace at the start of care in labour was considered the exposure. The study did not aim to examine differences in maternal or perinatal mortality, since their low occurrence in the Danish low-risk population (0.065‰ and 3‰, respectively) would require an extremely large and therefore unrealistic number of participants. The data were recorded in accordance with the National Birth Register and the North Jutland Birth Register, standards and guidelines applying to all four units and with which all midwives and doctors in the region were familiar. A stop watch was used when measuring Apgar scores. Postpartum haemorrhage was routinely estimated rather than measured. Clinically important differences were defined, and power calculations performed for all the above-mentioned clinical endpoints. The frequencies used in the calculations originate in the North Jutland Birth Register and the international literature. Estimations of sample sizes were based on power calculation for the primary outcomes: Apgar score <7/5 min and caesarean section. The limited number of FMU births, at 300–350 per year, was also taken into account. The study was originally planned to include data on 1027 FMU participants and 1027 control participants over a period of 3.5 years, starting 1 January 2005; however, in October 2006, the local authorities unexpectedly announced the closure of its two FMUs. The National Board of Health expressed concern that the local authorities had introduced a new model of care that had not been subjected to adequate evaluation. The power to detect differences between our two study groups was consequently reduced, and a thorough revision of the study protocol was required. At the time of the FMU closures, 550 FMU participants had been included, and in order to obtain the largest possible sample of FMU participants, we included all of the 289 eligible women who had been admitted to the FMUs since the opening of the second FMU (1 March 2004). These women were prospectively matched with women from the nearest OU, thus ensuring total samples of 839 women in each group. After the FMU closures, power calculations were rerun. The results showed that with a sample of 839 women in each group, the study sustained the power to detect clinically relevant differences between groups on all primary and secondary outcomes. For the two primary outcomes, the revised sample provided power (5% significance level, 80% power) to detect an increase in Apgar score <7/5 min from expected 1.07% in the OU group to 3.1% in the FMU group and a reduction in the incidence rate of caesarean section from 8.8% in the OU group to 5.5% in the FMU group. Analyses were based on the intention-to-treat principle and carried out using STATA software, V.11. The two groups (matched 1:1) were compared by paired tests on all measures, the McNemar' test for paired binary data (medical data on the birth process) and the Wilcoxon signed-rank test for paired continuous data (eg, birth weight). As we were concerned that residual confounding might remain, a supplementary regression analysis adjusting for the matching characteristics was performed using both continuous and grouped variables.47 48 For ease of interpretation (eg, calculation of confidence bands), ordinal outcomes were dichotomised, but we controlled for conclusive agreement with test results based on the original data. The analysis for occipital posterior position was performed after excluding caesarean deliveries. For all comparisons, relative risks with 95% CIs were calculated. All reported p values were two-sided, and the level of statistical significance 5%. To check for bias introduced by the inclusion of FMU women giving birth in 2004, supplementary subgroup analyses were performed on 2004 data and main data, respectively. A low-risk match was prospectively identified for all 839 women admitted to an FMU, and full follow-up was obtained for all 1678 women. Of the 839 FMU women, 733 (87.4%) gave birth as planned in the FMU or at home, assisted by a FMU midwife (cf. figure 1). Transit births were included in the few cases where the woman had consulted a midwife <24 h before giving birth and had been advised to stay at home longer or return home. Ninety-seven FMU women (11.6%) were transferred intrapartum; among these, two gave birth in the ambulance. Eleven, who were in early labour, were transported in their own vehicle. Twenty-seven transfers (3.2%) took place <2 h after birth, another 13 (1.5%) during the postnatal stay. The total number of transfers was 137 (16.4%). As shown in table 1, the matching produced two fully comparable groups in terms of key medical and socio-demographic factors. The FMU women's background details reflected the life conditions of the local population in general.40 49 With Aalborg and Hjørring municipalities as exceptions, the educational and income levels in North Jutland rank as the lowest in Denmark. In the FMUs' predominantly rural catchment areas, unemployment rates are high, which is reflected in a slightly higher rate of FMU women without employment outside the home. No statistically significant differences between the two study groups in the rate of infants with an Apgar score of <7/5 were found (RR: 1; 95% CI 0.3 to 3.4). The use of caesarean section (0.6, 0.3 to 0.9) was significantly reduced among FMU women compared with OU women (see table 2). No significant differences were found in perinatal outcome such as an Apgar score of <7/1 at 1 min and <9 at 5 min; neonatal asphyxia; neonatal admittance to NICU; neonatal stay in NICU >48 h or neonatal readmission to hospital 0–28 days postpartum (see table 2). One infant was delivered by caesarean section owing to umbilical-cord prolapse in the hospital where an FMU was co-located. As a result, a sensitivity analysis was conducted on the hypothesis that, had the women been transferred, the infant would have had an Apgar score of <7/5 min. Analysis showed no difference between groups (1.25, 0.3 to 4.6) and did not affect overall findings. Full case details are given in online table C on adverse outcomes. As shown in table 2, compared with OU women, FMU women were significantly less likely to experience: abnormal fetal heart rate leading to action (0.3, 0.2 to 0.5); dystocia in labour (0.4, 0.3 to 0.5); intrapartum fetal–pelvic complications (0.2, 0.05 to 0.6); shoulder dystocia (0.3, 0.1 to 0.9); occipital posterior presentation at birth (0.5, 0.3 to 0.9); postpartum haemorrhage >500 ml (0.4, 0.3 to 0.7) and 1st/2nd degree tear (0.9, 0.8 to 0.97). Moreover, compared with OU women, FMU women were significantly more likely to experience: intact perineum (1.1, 1.02 to 1.2) and discharge <6 h postpartum (0.6, 0.5 to 0.7). No significant differences were found in meconium-stained amniotic fluid; postpartum haemorrhage >1000 ml; third- and fourth-degree tear; maternal readmission/outpatient visit 0–28 days postpartum and severe maternal morbidity. In addition, infant birth weight (mean: 3.636 kg (FMU) and 3.641 kg (OU), cervical dilatation on admission (mean: 4.4 cm (FMU) and 4.3 cm (OU)) and duration of admission for labour care (mean: 5.3 h (FMU) and 5.6 h (OU)) were no different between the two study groups. As shown in table 3, compared with OU women, FMU women were significantly less likely to experience: instrumental delivery (0.4, 0.3 to 0.6), oxytocin augmentation in labour (0.5, 0.3 to 0.6), treatment for shoulder dystocia (0.1, 0.01 to 0.8), perineal suturing (0.8, 0.7 to 0.9), intrauterine palpation (0.3, 0.1 to 0.9) and epidural analgesia (0.4, 0.3 to 0.6). Moreover, compared with OU women, FMU women were significantly more likely to experience spontaneous vaginal birth (1.06, 1.03 to 1.09) and the use of a water tub for pain relief (1.4, 1.2 to 1.6). No significant differences between groups were found for one or more uterotonics, and non-recumbent position for birth. A regression analysis adjusting for the matching characteristics showed coinciding results with the match analysis, thus confirming the robustness of our results and matching. A subgroup analysis comparing the late collected data on 2004-FMU participants with the main, prospectively collected data detected no systematic differences or deviation of results between the two bodies of data. All reasons for transfer are tabulated in table 4. Overall intrapartum transfer rates (up to 2 h postpartum) were 14.8% but different for primiparous and multiparous women (36.7 vs 7.2%). The most common reason for transfer for all women was slow progress of labour. Ambulance transfers from the two FMUs averaged 42/38 min (range: 20–60). After transfer, women had shared care between an obstetrician and a midwife, and 36% of transferred women continued to be cared for by the FMU midwife under the supervision of an obstetrician. Adverse outcomes were defined as severe maternal morbidity, perinatal mortality, Apgar score <7/5 min and >1 week NICU admittance. One incident of severe maternal morbidity (uterine rupture) occurred among the OU women. In the FMU group, one perinatal/neonatal death occurred owing to an undetected, severe congenital malformation. Nine infants were born with 5 min Apgar scores of 4–6; three belonged to the FMU group but were born in an OU following intrapartum transferral. Eight of the nine infants were admitted to NICU; all were later discharged well. Three infants from the FMU group, who were born in an OU after transfer, had NICU stays exceeding 1 week. One infant with a 5/5 Apgar score had a stay of 36 days, but this was due primarily to an undetected congenital heart disease. One adverse perinatal event was dealt with in an FMU shortly after its opening. Owing to an umbilical-cord prolapse, an emergency caesarean section was carried out by a gynaecologist, employed at the unit before its transformation into a FMU and summoned against protocol. The Apgar scores were 10/1, 10/5. Supplementary information on all adverse events is provided in online table C.
This study was powered to compare two primary maternal and infant outcomes for women at low risk who intended to give birth in FMU or OU settings. We found no significant differences in Apgar score <7/5 min, and women in the FMU group were less likely to have experienced a caesarean section. Looking at secondary outcomes, there were no significant differences between Apgar scores <9/5, <7/1 min; total number of NICU admittances; NICU admittance >48 h; neonatal asphyxia; or neonatal readmission to hospital. Among this population of low-risk women, women in the FMU group compared with the OU group were significantly less likely to experience dystocia, intrapartum fetal–pelvic complications, occipital–posterior position of the infant at birth, shoulder dystocia, oxytocin augmentation, instrumental delivery and postpartum haemorrhage >500 ml. Moreover, women in the FMU group were significantly more likely to experience spontaneous vaginal birth and intact perineum. The limitations of our study stem partly from its observational design, and partly from the sudden closure of the two FMUs. A non-randomised study design precludes elimination of all potential confounding factors; only known confounders can be adjusted for, and only as far as they can be accurately measured. Despite our close matching of study groups and adjustment for matching factors, residual confounding and confounding by unknown factors related to women's choice of care in labour may persist. In addition, bias linked to the delayed data collection for 289 FMU participants from 2004 cannot be ruled out, but we were somewhat reassured to find that the 2004 data were in conformity with the later data. Our contention that such a risk is limited is also supported by the fact that no interventions were performed in the study, participants were included on the same principles, individual and project-specific data collections were performed for all participants, patient records were of good quality, and all control participants were prospectively included. The obstetric quality indicators, which were compiled annually by the units, were closely followed to detect any changes in practices or technology use; no systematic changes occurred during the study period. No new technology was introduced, and no major changes in obstetrical practices were implemented. Furthermore, some outcomes (Apgar scores, postpartum haemorrhage) were exposed to measurement subjectivity, others were proxies for morbidity, although globally used quality indicators/research outcomes, and the number of events in some analyses was low. It is also uncertain whether the outcomes would have been different for the two FMU infants had (1) a caesarean section not been performed and (2) the infant with severe congenital malformation been born in the alternative setting. Ideally, the results should be confirmed (or refuted) in a large randomised controlled trial, but as the recruitment of an adequately large number of women willing to be randomised to place of birth would be logistically challenging, the most robust design seems to be a large prospective cohort study. We present findings from the second-largest prospectively controlled study of FMU care so far. A major strength of our study is that it compares processes and outcomes from women who have been prospectively judged to be at low obstetric risk in two well-defined and carefully established settings in the same region and that care for women in both groups is provided by midwives. Also, contrary to several earlier studies,10 16 29 the data are complete, as all eligible women planning to give birth in the FMU settings were included, and a full follow-up on all participants was carried out. We found no differences in perinatal morbidity between groups, and our results agree with the results of most studies of FMU versus OU care.6 11 18–30 Although women were transferred to the OU without delay (3–23 h before giving birth), it is a concern that the three NICU stays exceeding 1 week occurred in the FMU group. Further study of rare adverse outcomes and optimisation of care for transferred women is needed. The study findings also agree with other studies of FMU care6 10 18 24 26 28 29 that have all reported a reduced incidence of birth interventions while the caesarean section rate is seldom found to be affected, something which may stem from inadequacies in the power or robustness of their design. In this respect, our study forms an important exception in finding a significant reduction in caesarean section in women in the FMU group. In addition, the present study is the first to report that FMU women were significantly less likely to experience fetal–pelvic complications, occipital–posterior position of the infant at birth and shoulder dystocia compared with OU women. The overall rate of transfers intrapartum and <2 h after birth at 14.8% is comparable18 or slightly lower than that found in some studies of FMU care21 22 24 26 (18–24%), though one study6 reported a slightly lower rate of 12%. Few studies report transfer rates for primiparas and multiparas separately, but a large American study also finds a transfer rate of 7% for multiparas but a lower rate of 29% for primiparas.24 In all studies, slow progress of labour was one of the most common reasons for transfer, depending on the strictness of transfer guidelines. These findings provide information upon which women, professionals and policy makers can make decisions. However, these will vary depending upon individual preferences and trade-offs. We suggest that the assessment of the risk of rare adverse outcomes in low-risk FMU births be balanced against our findings that infant morbidity was not affected, and women intending to give birth in a FMU are less likely to suffer complications or undergo caesarean section and other birth interventions when compared with women intending to give birth in an OU. Any generalisation of our findings must consider the full public funding of all maternity services in Denmark. The FMU midwives were skilled in dealing with obstetric emergencies, cooperation between FMUs and OUs was excellent, and the local implementation of multidisciplinary guidelines for referral and transfer was based on the best evidence available, thus improving the reliability of care provided. Furthermore, the FMUs were located in community hospitals that offered life-supporting assistance in emergencies. Generalising to other countries offering different conditions should be made with caution. The distances between the four units studied were 35–55 km; FMU and OU care was thus not equally accessible to all women. Taking into account the characteristics of women in the study and the finding of convenience/proximity as the most important factor in North Jutland women's choice of birthplace,57 we hypothesise that philosophies/ideas about childbirth play a minor role in our study in comparison with studies involving women whose choices are not affected by geography. Further work should examine the potential influence of birth expectations and perceptions on women's choice between FMU and OU care to determine any impact of world views or philosophies on birth outcomes. Additional aims would be to elucidate the underlying elements of FMU care and their influence on outcomes, and to explore the potential differences between alongside midwifery units care and FMU care. Operational efficiency, cost-effectiveness and rare outcomes also present areas for further work, the latter through a rigorous review of controlled studies of FMU. In conclusion, the present study found no increase in perinatal morbidity among infants of low-risk women intending to give birth in an FMU compared with infants of women intending to give birth in an OU. Among the FMU women, it found reduced maternal morbidity, fewer caesarean sections and other birth interventions, along with an increased likelihood of spontaneous vaginal birth. Further study of rare adverse outcomes is needed. Care in FMUs may be considered an adequate alternative to OU care for low-risk women within a network of supporting OUs. Pregnant women should thus be given an informed basis for their choice of birthing place, with information on key maternal and infant outcomes, and transfer rates for multiparous and primiparous women. FMU care seems to offer important lessons that should also be brought to bear on the development of OU care for low-risk women. We are indebted to the project staff for their dedication to the study. We thank the physicians and midwives at the participating units for their corporation, The Department of Biostatistics, Aalborg University, epidemiologist K Overvad, Aalborg University Hospital, NJ Secher, Hvidovre Hospital, and medical statistician P Seed, Division of Women's Health, King's College London School of Medicine, for critical review of the study protocol and advice.
. Throwing the baby back into the bathwater. BMJ 2010;341:c4192.
. The Quebec midwifery experiment: lessons for Canada. Can J Public Health 2000;91:5–6.
. Fornuft og følelser i fødselsomsorgen. Tidsskr Nor Lægeforen 2005;20:2818–20.
. Zentralisierung in der Geburtshilfe: pro und contra. Z Geburtsh Neonatol 1996;200:2–12.
. Editorial: place of delivery and adverse outcomes. BMJ 2010;341:c5560.
. Evaluation of the Edgware Birth Center. Middlesex: North Thames Perinatal Public Health, 2000.
. Experience of childbirth in birth center care. A randomized, controlled study. Acta Obstet Gynecol Scand 1994;73:547–54.
. Ongoing relationships with a personal focus: mothers' perceptions of birth centre versus hospital care. Midwifery 2001;17:171–81.
. Experiences of Australian mothers who gave birth either at home, at a birth centre or in hospital labour wards. Soc Sci Med 1993;36:475–83.
. Comparison of midwifery care to medical care in hospitals in the Quebec pilot projects study: clinical indicators. L'Equipe dEvaluation des Projets-Pilotes Sages-Femmes. Can J Public Health 2000;91:I5–11.
. 'I felt as though i'd been in jail': women's experiences of maternity care during labour, delivery and the immediate postpartum. Fem Psychol 2005;15:315–42.
. Alternative versus conventional institutional settings for birth. Cochrane Database Syst Rev 2010;(9):CD000012.
. Satisfaction and the three C's: continuity, choice and control. Womens's views from a randomised controlled trial of midwife-led care. Br J Obstet Gynaecol 1997;104:1273–80.
. Delivered with Care: a National Survey of Women's Experience of Maternity Care in England. Oxford: National Perinatal Epidemiology Unit, 2010. National Perinatal Epidemiology Unit. The Birthplace in England Research Programme. Report of Component Study 1: Terms and Definitions. England: Oxford University, 2007.
. Outcomes, safety, and resource utilization in a collaborative care birth center program compared with traditional physician-based perinatal care. Am J Public Health 2003;93:999–1006.
. Maternity care outcomes: assessing a nursing model of care for low-risk pregnancy. Outcomes Manag Nurs Pract 1998;2:271–5.
. Outcomes and procedures in low risk birth: a comparison of hospital and birth center settings. Birth 1987;1:18–24.
. Management of labour in an isolated rural maternity hospital. BMJ 1996;312:223–6.
. Evaluation of a midwifery birthing center in the Canadian North. Circumpolar Health 1998;57(Suppl 1):116–20.
. [Birthplace free-standing birth center—perinatal data in comparison with clinic deliveries in Bavaria and Berlin] (In German). Z Geburtshilfe Neonatol 2004;208:110–17.
. Obstetric outcomes at the birth place in Menlo park: the first seven years. Birth 1989;16:123–9.
. A free-standing low-risk maternity unit in the United Kingdom: does it have a role? J Obstet Gynaecol 2004;24:360–6.
. The National Birth Center Study. Part II–Intrapartum and immediate postpartum and neonatal care. J Nurse Midwifery 1992;37:301–30.
. 10 years Charlottenburg Birthing Centre. Report on 10 years of births in the 1. European birthing centre in Berlin, Klausenerplatz (article in German). Kinderkrankenschwester 1997;16:429–30.
. A birth center affiliated with the tertiary care center: Comparison of outcome. Obstet Gynecol 1986;4:598–603.
. Deliveries in maternity homes in Norway: results from a 2-year prospective study. Acta Obstet Gynecol Scand 2002;8:731–7.
. Perinatal outcome in hospital and birth center obstetric care. Int J Gynaecol Obstet 1999;65:149–56.
. Clinical and cost outcomes of a free-standing birth center: a comparison study. Clin Excell Nurse Pract 1997;7:456–65.
. The BirthPlace collaborative practice model: results from the San Diego Birth Center Study. Prim Care Update Ob Gyns 1998;5:207.
. Review of Evidence about Clinical, psychosocial and Economic Outcomes for Women with Straightforward Pregnancies Who Plan to Give Birth in a Midwife-led Birth Centre, and Outcomes for their Babies. Oxford: The National Perinatal Epidemiology Unit, 2005.
. Why women do not accept randomisation for place of birth: feasibility of a RCT in The Netherlands. BJOG 2009;116:537–42.
. Behovet for jordemoderledede fødeklinikker på Fyn samt analyse og markedsføring af det frie sygehusvalg i forbindelse med graviditet og fødsel. Speciale. Center for Cand. Negot. Studiet. Odense: Syddansk Universitet, 1997.
. LOV nr 429 af 31/05/2000 om behandling af personoplysninger. København: Justisministeriet, 2000.
. Matched cohort methods for injury research. Epidemiol Rev 2003;25:43–50.
. Matching and efficiency in cohort studies. Am J Epidemiol 1990;131:151–9.
. To match or not to match in epidemiological studies–same outcome but less power. Int J Environ Res Public Health 2010;7:325–32.
. Oplevelsesøkonomi, udvikling og planlægning i Nordjyske kommuner. Aalborg: Institut for samfundsudvikling og planlægning. Aalborg University, 2009. Danmarks Statistik. Statistikbanken. http://www.statistikbanken.dk/statbank5a/default.asp?w=1280 (accessed 2 Mar 2011).
. Time is on whose side? Time trends in the association between maternal social disadvantage and offspring fetal growth. A study of 1 409 339 births in Denmark, 1981–2004. J Epidemiol Community Health 2009;63:281–5.
. Trends in socioeconomic differences in Finnish perinatal health 1991–2006. J Epidemiol Community Health 2009;63:420–5.
. The Spirit Level: Why equality is better for every one. United Kingdom: Pinguin Books Ltd, 2010.
. Socioeconomic disparities in adverse birth outcomes: a systematic review. Am J Prev Med 2010;39:263–72. National Institute for health and clinical excellence. Intrapartum Care for Healthy Women and their Babies During Childbirth. NICE clinical guideline 55, NICE, London, 2007.
. Evaluating non-randomised intervention studies. Health Technol Assess 2003;7:iii–173.
. On the Evidence for Decisions about the Use of Therapeutic Interventions. THE HARVEIAN ORATION. Delivered Before the Fellows of The Royal College of Physicians of London on Thursday 16 October 2008. Royal College of Physicians, London, 2008. The Region of North Jutland. Population Information 01.02.2011. Denmark: 2011. http://www.rn.dk/Regionen/FaktaOmNordjylland/Befolkning.htm.
. Continuous support for women during childbirth. Cochrane Database Syst Rev 2007;(3):CD003766.
. Position in the second stage of labor for women without epidural analgesia. Cochrane Database Syst Rev 2005;(3):CD002006.
. Maternal positions and mobility during the first stage of labour. Cochrane Database Syst Rev 2009;(2):CD003934. , eds. Obstetrics: Normal and Problem Pregnancies. 4 edn. USA: Churchill Livingstone. 2002.
. Effects of oxytocin-induced uterine hyperstimulation during labor on fetal oxygen status and fetal heart rate patterns. Am J Obstet Gynecol 2008;199:34–5. Sundhedsstyrelsen. Fødsler, graviditet og BMI - 1. halvår 2008. Copenhagen: Sundhedsstyrelsen. 2008. World Health Organisation. Neonatal and perinatal mortality: country, regional and global estimates. WHO. 2006.
. Valg af fødested - en undersøgelse af gravides valg af fødested og deres ønsker for tilbud på fødeklinikker. Aalborg: Nordjyllands Amt. Center for Kompetenceudvikling. 2005. Funding The study was funded by grants from: the Augustinus Foundation, the Obel Family Foundation, the Oticon Foundation, the University College North Jutland Research and Development Fund, and the Danish Association of Midwives Research and Development Fund, all of which are gratefully acknowledged. Ethics approval Ethics approval was provided by Danish Data Protection Agency (reference number: 2005-41-5352). Contributors CO was responsible for the study's conceptual design, designed the data collection tools, monitored all data collection, cleaned the data, and participated in the analysis and interpretation of data. She also drafted the article and wrote the final version. She is guarantor. AMM participated in the conceptual design of the study and the interpretation of data. MF-G participated in the analysis of data. LBK and JS participated in the interpretation of data. All of the authors critically revised the manuscript for important intellectual content, and read and approved the final version that was submitted for publication.